Since we seem to be going through a, erm, transitional period, weather-wise, this soup seemed like a fresh, but still warm and comforting soup to battle the impending snowstorm. Warm a stockpot over medium heat. Add the oil. When hot, add the chicken legs. Brown all sides for about ten minutes, rotating them for an even browning as necessary. Meanwhile, combine the miso paste with about 1 cup of the chicken broth. Mash it with a spoon to dissolve. Set aside. When the chicken has a nice, brown crust, add the remaining chicken broth, the water and the dissolved miso paste. Deglaze the pot by scraping any browned bits from the bottom. 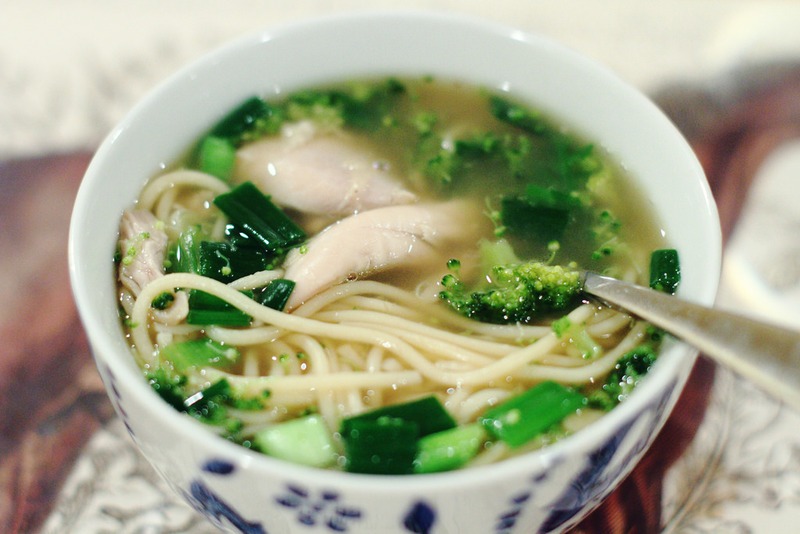 Turn off the heat on the broth, and skim any excess fat off the top. While the chicken is cooling, cook the pasta according to directions – but be very careful to not overcook. Drain and set aside. Prepare the vegetables. Wash and dice the green onions, chop the broccoli florets into bite-size chunks, wash the arugula. When the chicken is cool enough to be handled, remove skin and tear or chop into bite-size chunks. Return the broth to a low flame. Add the broccoli and chicken and allow to simmer until broccoli is cooked but firm. Turn off heat and add green onions and arugula. Due to the saltiness of the miso, you may not need to add any salt, but feel free to add some pepper! Ladle soup into bowls, and divide the noodles among each bowl. Serve hot! Ohh this sounds really good to me! I'd love to try it!